# No streaking and easy to apply. # Individually heat sealed packet maintains quality and integrity of product to ensure long-lasting life. * Always start with a clean, dry body. * Can take 2 applications to achieve desired results. * Moisture Mist, and On The Glow are the only recommended products to use right after Tan Towel application, otherwise, it is recommended to wait 3-4 hours before applying moisturizers. 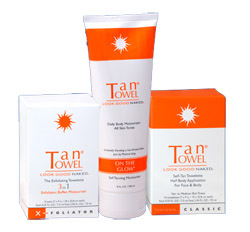 * Tan Towel contains no stains or dyes so you will not see any immediate color. The only way any discoloration will appear is if you miss a spot (or if you apply to wet skin), so be thorough in your application. * IMMEDIATELY after applying, thoroughly wash the palms of your hands. No reviews yet - add one here!